'Hammers clanging' was the sound that the great nineteenth-century novelist William Makepeace Thackeray associated with Belfast when he visited it in 1842. By then, Belfast's industrial development was well under way. Had Thackeray visited the city in 1900, he would not have been surprised to find that it was by then the fastest-growing city in the British Isles. It had outstripped Dublin as the largest on the island of Ireland; indeed, it ranked third in the British empire ... and still echoed to the sound of those clanging hammers. Industry lay at the heart of the city's manufacturing prowess. The shipyards dominated the central harbour area. The textile mills ' over 200 of them ' seemed to be on every street corner. The constant movement of workers and goods, the smells and sounds of constant industrial activity, and that distinctive clang of metal on metal, dominated the city's daily life. The city's expansion made it a magnet for the many thousands who migrated there in search of work. This forms the focus of the first chapter, '"The town broke loose": growth'. Belfast's population multiplied many times between 1750 and 1914 ' in 1900 only a quarter of the city's population had been born there. 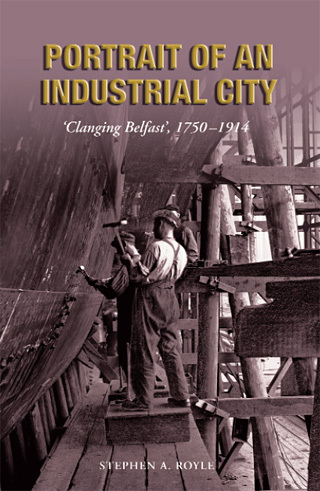 Industrialisation was the engine of Belfast's remarkable growth and the principal contributors to its industrial development ' shipbuilding, linen and engineering ' take pride of place in the second chapter. The hectic nature of the thriving and constant activity on the streets of the city (for example, 'scavengers' were employed to scoop up and recycle the manure left on the streets by horses) and the equally rumbustious local and national political goings-on at a critical time in Ireland's history are given close attention. Throughout the book, the deft use of primary sources and documents illuminates the intriguing story of Belfast, an industrial city described in 1914, at the end of our period of interest, as 'really a wonder'. Stephen A. Royle studied geography at St John's College, Cambridge and then took a PhD at the Univeristy of Leicester. he moved to belfast in 1976 to a lectureship in geography at Queen's University, where he is now professor of island geography. His book sinclude North America: a geographical mosaic (edited with Frederick W. Boal, 1999); A geography of islands, small island insularity (2001); Enduring City: Belfast in the twntieth century (edited with Frederick W. Boal, 2006); The company's island: St Helena, company colonies and the colonial endeavour (2007); Doing development differently: regional development on the Atlantic periphery (edited with Susan Hodgett and David Johnson, 2007) and Company, crown and colony: the Hudson's Bay Company and terrtitorial endeavour in western Canada (2011). Stephen Royle is treasurer of the International Small Island Studies Association, deputy editor of Island Studies Journal, chair of the Northern Ireland region of the Royal Geographical Society and former president of the Ulster Society for Irish Historical Studies, the Geopgraphical Society of Ireland and the Belfsat branch of the Geographical Society of Ireland and the Belfast branch of the Georgraphical Association. he is a member of the Royal irish Academy.